Download pdf Create a campus where students thrive. 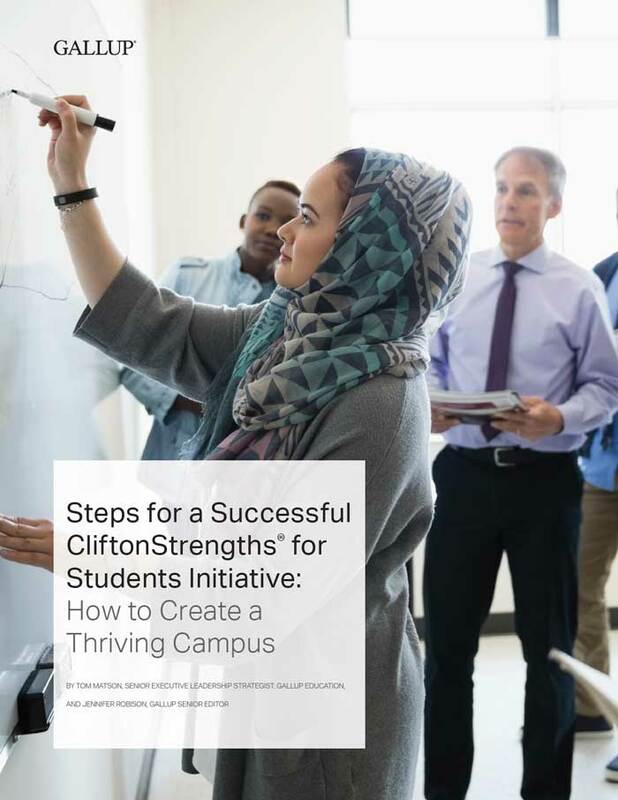 Learn the proven steps to execute a successful CliftonStrengths® for Students initiative and prepare your students to thrive on campus and after graduation. This paper provides a framework to help your school's leaders, faculty, administrators and students use a strengths-based approach to build an engaged and thriving campus community. Gallup has helped hundreds of campuses improve student engagement and well-being using a focus on CliftonStrengths. Each campus is unique, but the most successful initiatives share a common framework to achieve great outcomes. Start building an engaged and thriving campus today. To receive an email with a link to download this paper, please fill out the form below. Someone from Gallup may contact you via email or phone about your interest in this topic.